Before you say “What? brownies the week of Thanksgiving and just before Christmas? How boring.” Oh, wait a minute, that is what I mumbled to myself as I began today’s project. Boy was I wrong! 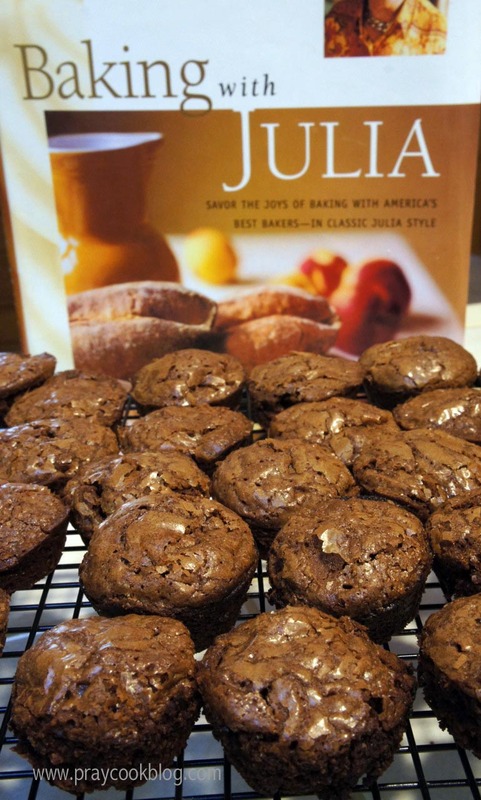 Twice a month a group of 400+ bakers join together, bake the same recipe from Dorie Greenspan’s cookbook, Baking With Julia. Recipes are chosen by nomination and I was surprised when this week’s recipe turned up to be brownies, even though the title states “Best-Ever” Brownies. 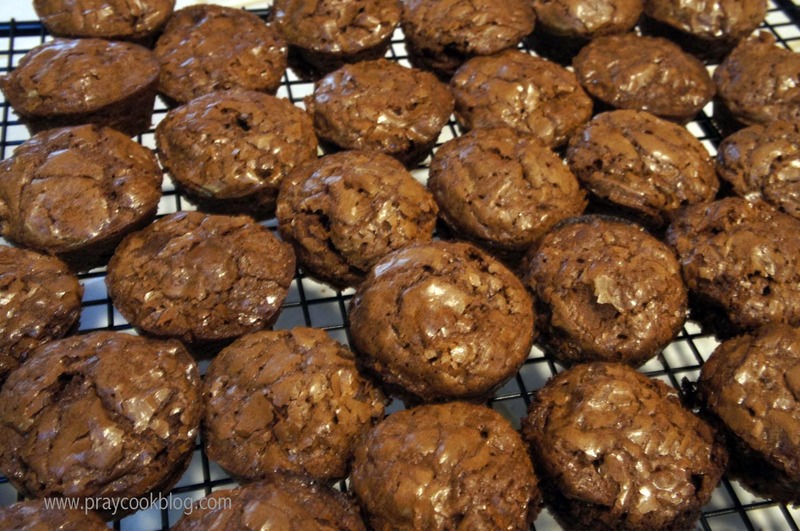 The recipe calls for 4 ounces unsweetened chocolate and 2 ounces bittersweet chocolate. I had 2 ounces of unsweetened chocolate on hand, a package of bittersweet chips, semi-sweet chips and some white chocolate chips. I ended up using: 2 ounces unsweetened chocolate, 2 ounces bittersweet, 3 ounces semi-sweet chips and then I added in about 2 ounces of finely chopped white chips before baking. The chocolate (except the white chocolate) is carefully melted along with unsalted butter. I turned the burner on low, stirred as it melted and it did fine. 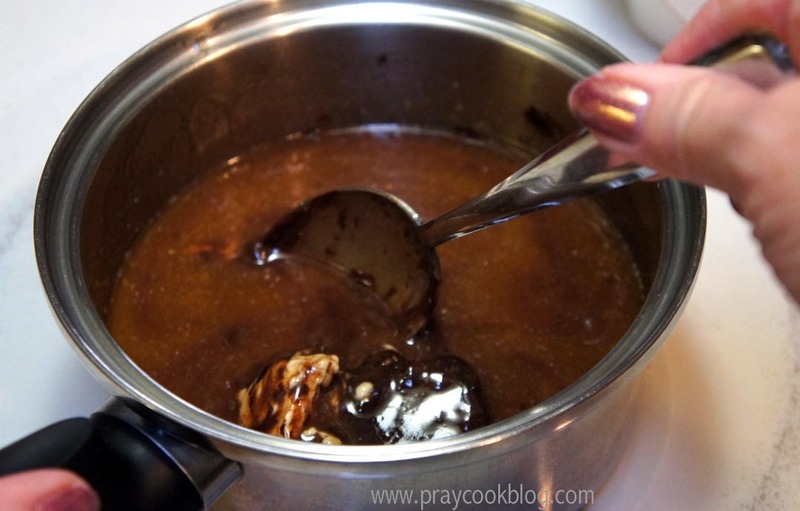 A cup of sugar is then stirred into the melted butter/chocolate mixture. Vanilla is added after the chocolate has melted and is removed from the stove. 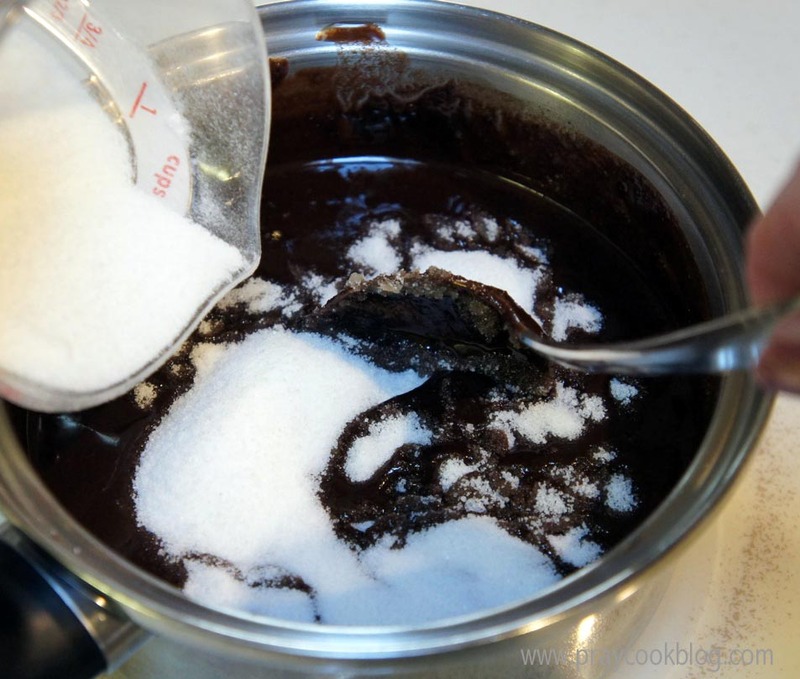 While the chocolate is melting I stirred together the remaining sugar and 4 eggs. Half of this mixture is then whisked into the chocolate/butter mixture. Constant stirring keeps the eggs for actually cooking from the heat of the chocolate. 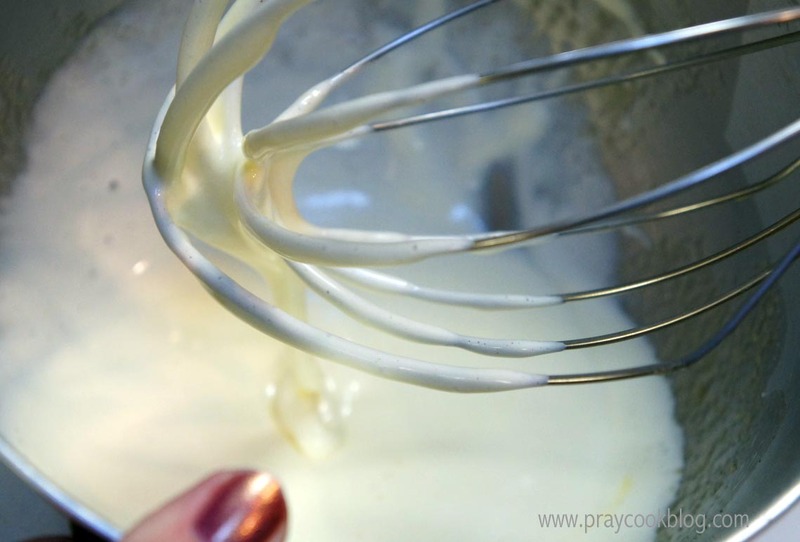 The remaining half of the egg/sugar mixture is whipped on high-speed until it is fluffy and doubled in volume. 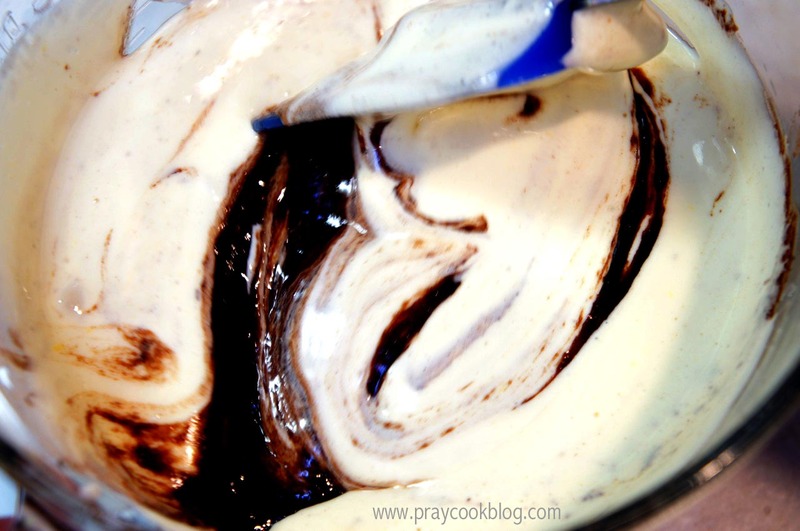 Mixing the chocolate into to the whipped eggs and the brownie batter begins to take form. Flour and salt are folded in to complete the process. I folded in the chopped white chocolate just to mix slightly. 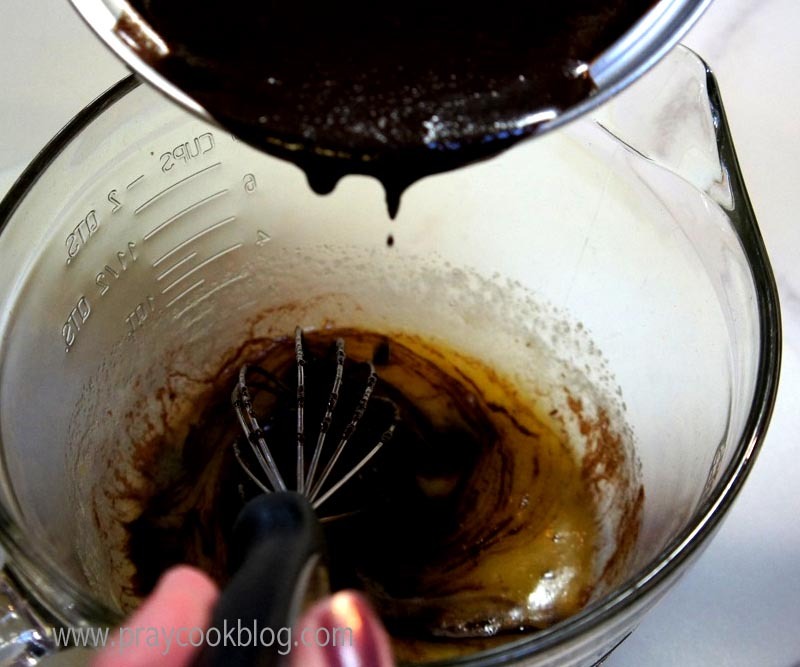 Brownie batter doesn’t like to be over-beaten so each step is mixed keeping this in mind. Next time I will leave out the white chocolate and add walnuts! Yum. The original recipe directs the batter be poured into a 9″ square pan and baked for 25 to 28 minutes. Do yourself a favor … get out your little mini-muffin tins, grease lightly and fill 3/4 full. Bake 18 minutes. 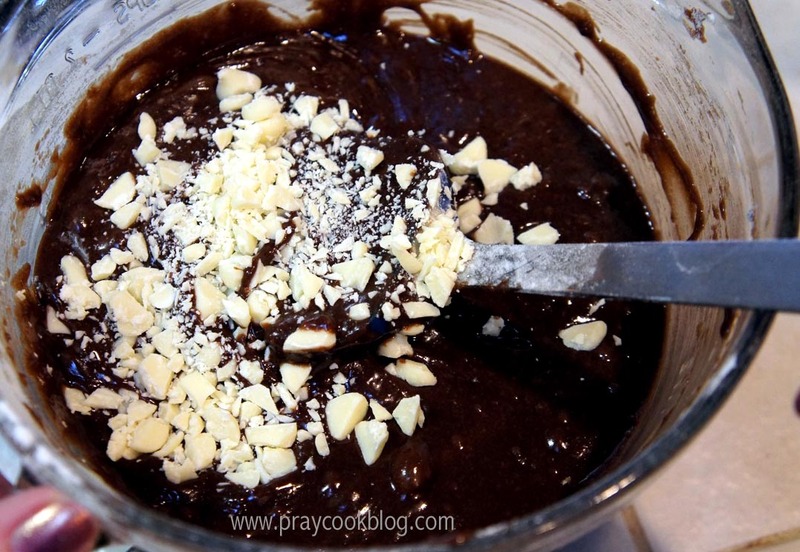 The result will be some of the “best-ever” brownies you will ever make or eat! I got 60 mini brownie-bites out of the recipe. I drizzled some with white chocolate, some with melted semi-sweet chocolate and some I left plain. 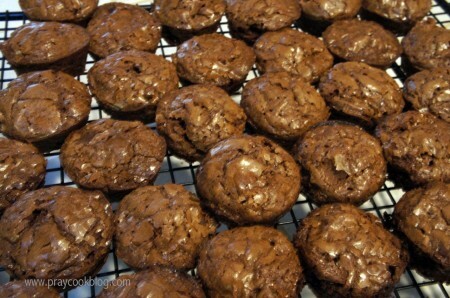 These little brownie bites are fudgey without being gooey. They will keep covered for 2 to 3 days at room temperature and can be frozen for up to a month. I promise you they will be the hit of any office potluck, Christmas open house or neighborhood gathering. I started out fussing about making brownies when there are so many exciting Christmas treats to be made. 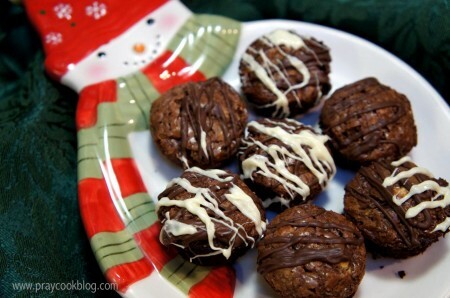 I ended up with some of the best-ever brownies and these treats will be showing up all over my holidays! The Chief and my sous-chef dish-washing mom got the honor of the first bites. As they grumbled about gaining weight during the holidays this small plate was devoured in short order amid a variety of oohs and aaahs!
. The results from other bakers can be seen by visiting the TWD blogroll. Such a cool idea to use different kind of chocolates! The cute bites with the white choco chips are quite festive! The little white chunks stayed in form and so they showed up inside, kinda cute! Sweet nibbles … for the soul 🙂 blessings my friend! I love your mini brownies. What a good idea!!! It’s a really chocoholic version!!! Thank you! I am already looking forward to making another batch before Christmas! Love that you made minis! Perfect! I was nervous because of all the comments about the baking time. When I decided to make the mini’s I hoped they would cook with no guessing about done or not done. I was right~ it worked perfect. Thanks for stopping by. They did turn out well and tasty too! I’m going to do them again, maybe with some peppermint candies! What a great idea. Have to try the mini version next time. Also love your addition of white chocolate. Great recipe. Thanks for stopping by. I sure love baking with the group! Brownie bites were a fun way to make these. Great idea! 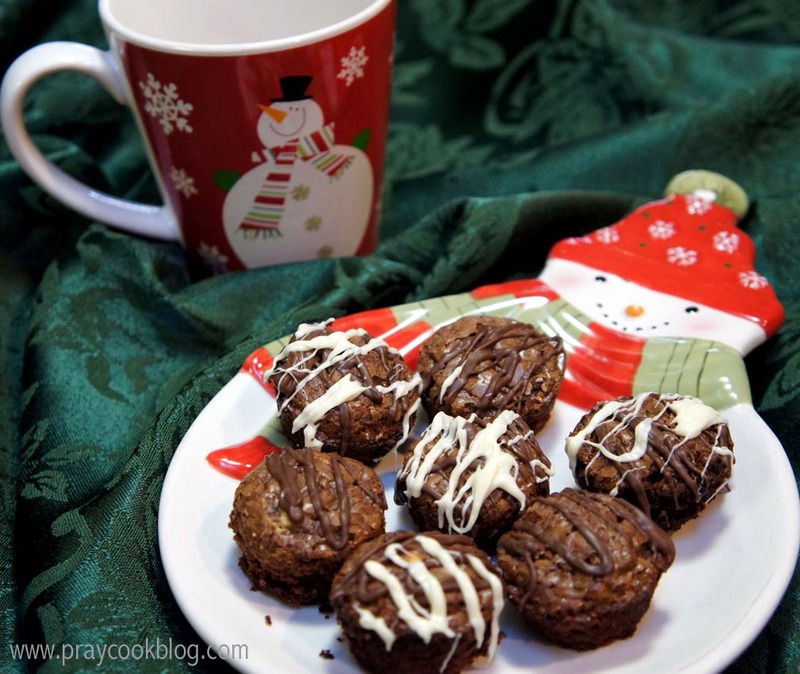 I love the idea of brownie bites! And white chocolate chips sound marvelous, too! Happy Thanksgiving! 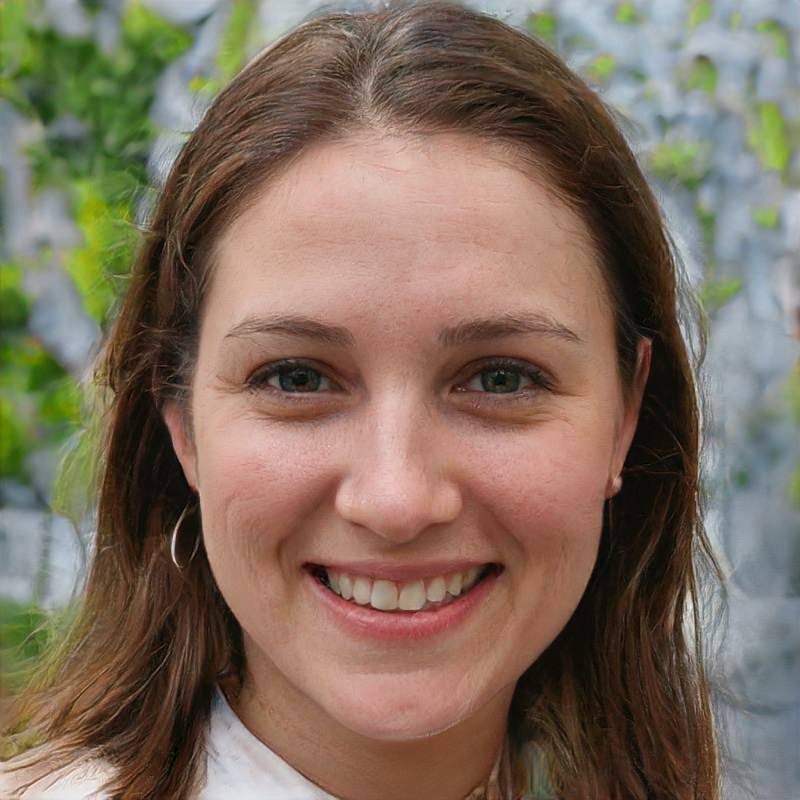 Thank you Liz and thanks for the Red Cross support button! The drizzled white chocolate looks so yummy! Thank you! I plan to make more of them for Christmas presents. 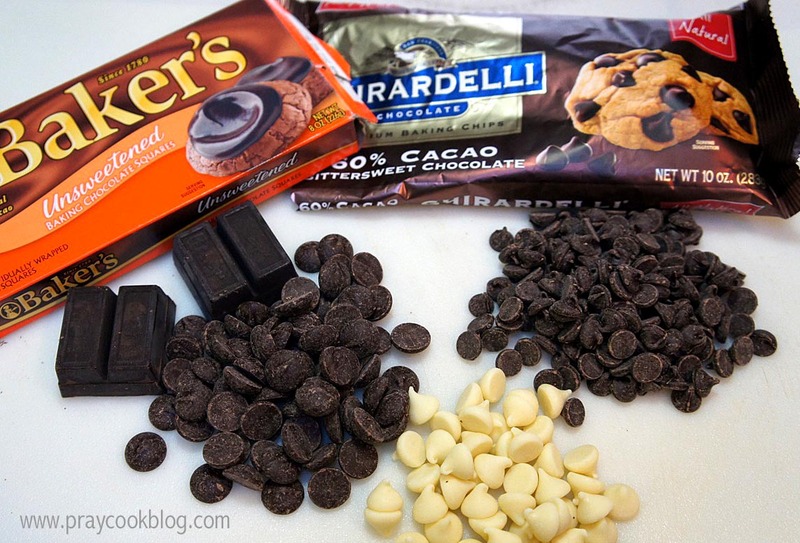 I love that you used Baker’s and Ghirardelli in that combo because I did the same thing! Great minds thinking alike! Always fun baking with you– Blessings! Yours look so beautiful! Wow- the white chocolate drizzle really makes them look nice. Happy Thanksgiving! What a great idea to make brownie bites with this recipe. They look fantastic, the kind of thing that would dissapear fast! I like the white chocolate, it probably made them even fudgier. Such a great idea! And brownies look so Christmas-y on a Christmas plate. Love the mini brownies. What a great idea. So much nicer than cutting brownies. And displays so nicely. 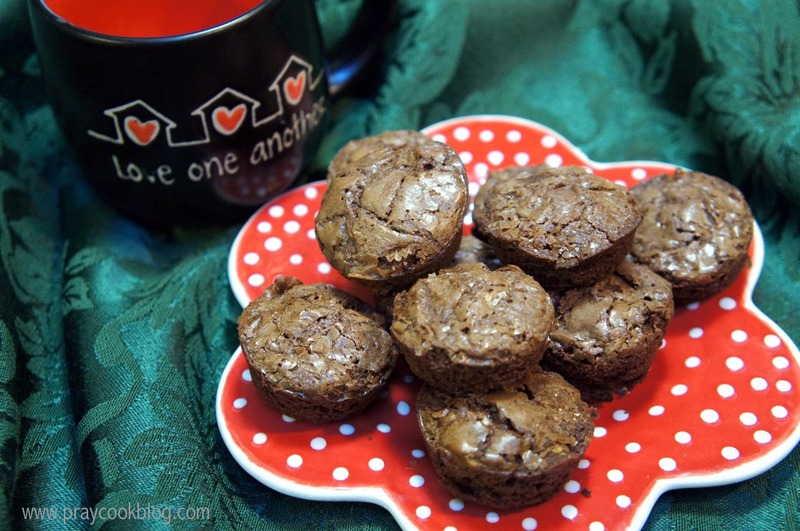 Love the idea of making mini-brownies! That’s great for portion control, and probably helps keep the sides from burning (like mine did!). 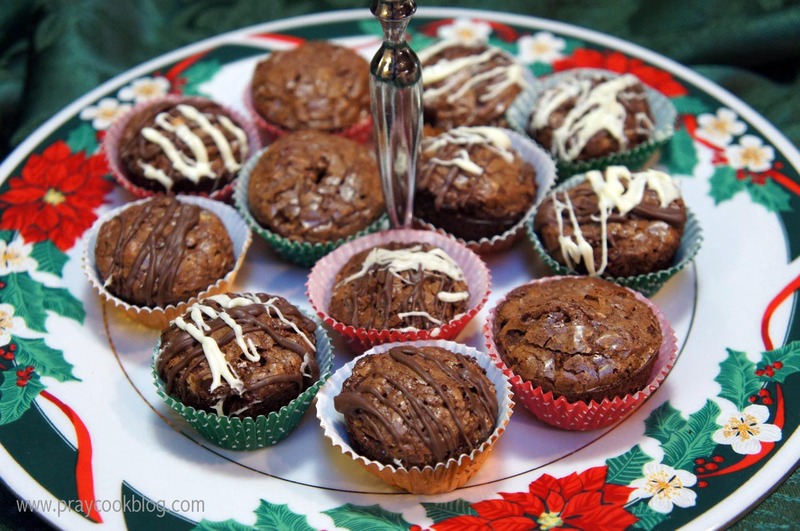 Your brownies really are quite lovely – very nice displays! I love that you made mini versions! They look fabulous! What a terrific idea to bake little mini chocolate brownie treats – and I do love the addition of some wonderful white chocolate to the batter. It all looks and sounds delicious. I also think that your seasonal plates, serving trays and mugs look fabulous! Oooh mini brownies! Love them! Well done on the delicious brownies! Looks wonderful! I like that we can look and see what everyone wrote about it too! Thanks! Happy Thanksgiving and many blessings! Love, love, love your minis! Also like the addition of the white chocolate. Looks like you have one yummy dessert. I do love the portion control! One great recipe.